Take a pan and heat oil. Add asafoetida, water apple, salt and sauté it for 2-3 minutes. Add about 3 tablespoon of water and let it simmer, stirring occasionally. 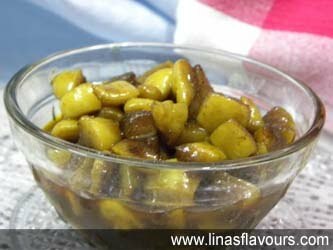 Add jaggery and cook it for 2-3 minutes more stirring continuosly till jaggery is melted and slightly simmered. Don’t overcook it otherwise jaggery will be caramelized. Let is cool. Serve it with roti, parathas or puris.